Skymark is Japan’s budget airline. Domestic flights in Japan are expensive and if you live in Okinawa they’re the only realistic option for getting up to mainland Japan. I’m visiting Tokyo for a few days in February so I thought I’d give Skymark a try. Hopefully I’ll save a bit of money, and at the least it will allow me to advise people better when giving travel advice. 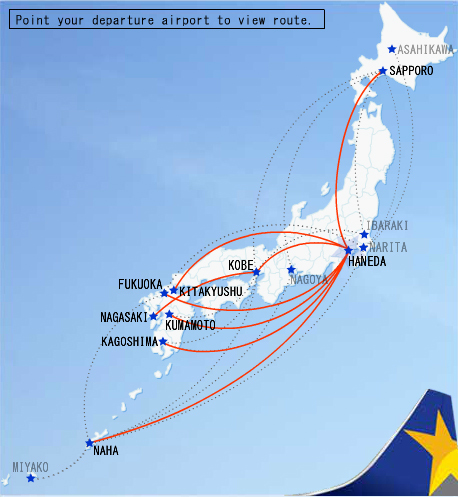 I wanted to fly Naha – Haneda return, so I visited the Skymark website which has an English section. A flight from Naha to Haneda ranges in price from 9,800 yen to 24,800 yen depending on how early you book. The key thing to know is that you can book a maximum of two months in advance. Bookings start from 9.30AM and due to demand you have to book at exactly 9.30AM two months previously to get the 9,800 or 10,800 yen tickets. I know this as this morning I entered my information at 9.32, selected the available web bargain flight and by the time I’d filled in the details form the ticket was no longer available. I quickly returned to the flight selection page selected the still available 12,800 ticket, entered my details and again the ticket was no longer available. Repeated the process and this time got to buy a 13,800 yen ticket. I’m quite a fast typer, but I guess I need to use auto fill if I’m going to get the cheapest fares in the future. I’ve flown Skymark a lot and they’re totally acceptable and I love how they’ve attached the Japanese airline market, but I’d much rather fly for 12,000 UA/CO ($25 + 7,000 yen each leg to fly premium) or AA Miles which I’ve not tried yet than pay even 10,000 yen for Skymark.